A warmly welcome trip down memory lane lightened my weary path after a long day's (wine) tasting at the not-so-long-ago London Wine Fair (yes, there was beer there too). Back in another life in the hazy mid 80s, when I was president of the St. Andrews Uni Real Ale Society (without long hair or beard I hasten to add: more in the floppy fringed goth style actually), we organised a wee day trip to a small unheard-of independent (sorry, touchy word at the mo in a Scottish context) start-up 'brewery' lost somewhere in the hills near Dollar, Clackmannanshire. Not easy to find, and when we did, we weren't sure we were there, as it was just a shack in the middle of nowhere from memory. Harviestoun was dreamt up, set up and improvised together by Ken Brooker in 1983, who moved into his first 'proper' brewing premises three years later. Our group was so impressed with the tasty ale we sampled there that some serious lobbying was in order back in St. Andrews, resulting in one (the only?) of their brews being given a slot in the, at the time, fairly new student union bar. Anyway, looking at their website, how times and things have changed (two lots of brew houses, a lot more people working for them, from one real ale to a whole range of cask, keg and bottled beers, and a sort-of couple of ownership switches later...). To the better, it would appear from this obviously innovative brewery's point of view and their now international customers. So, there I was cruising past a series of crowded small tables among the show's "niche importer/retailer/producer" tasting area looking for something refreshing to finish the day's 'work' with; and I suddenly saw the Harviestoun Brewery name, garnished with a stack of unfamiliar-looking bottles, prompting the aforementioned vivid flashback. Well done guys, keep up the good work. 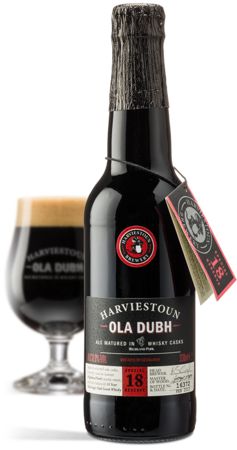 'Ola Dubh 18' bottle shot downloaded from www.harviestoun.com where you'll find tuns (ho ho) more info. Schiehallion Craft Lager (4.8% abv) - refreshing crisp and citrus-y style, quite intense and tasty finish. Equivalent to about £1.88 per 500 ml bottle (you can buy different case sizes of their beers online - I've given an indicative bottle price here).